Track Your Daily Activity - Small improvements in your daily exercise levels can improve your health. Set goals and targets yourself. Blood Pressure Monitoring - Understand your blood pressure and work with your support. The Blood Pressure Monitor is designed to make it simple to regularly check your blood pressure and upload your measurements directly to the Kinetik Health App. Accurate – with irregular heartbeat detector. Tested to ESH standards. Easy to read – large display. Convenient – pair via Bluetooth 4.0 with your phone or tablet. Simple to use – place the cuff on your upper arm, level with your heart. Press start and relax as the cuff automatically inflates. Your measurement will be displayed and uploaded to your paired device. Memory – stores the last 60 readings if you have not had time to synchronize with the app. The Activity Tracker will measure your activity throughout the day plus help you to understand your sleep patterns and quality. Night time – measures the quality of your sleep including restlessness and waking. Convenient and comfortable – wear on your wrist. Easy to use – pair via Bluetooth 4.0 with your phone or tablet. Easy to understand – upload your results to your paired device to review over time. 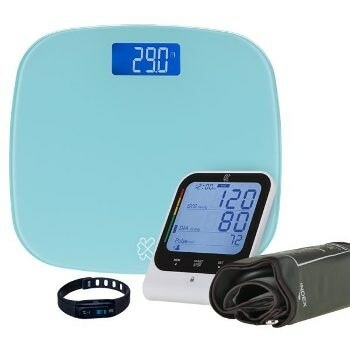 Discreet and attractive, the Digital Scales will help you to record your weight and track changes over time. Accurate – measures weight and records data. Easy to use – ‘step on’ operation. The MedM Health App will give you a complete picture of your vital health measures and help you understand your progress, all in the one place for life. Recording and tracking your blood pressure with an app makes it more likely you will stick with it over time, as well as giving you a simple more predictive way to stay healthy.